Mr. Isaac’s every corporate decision is guided by a social consciousness and an intention to positively impact and benefit maximum number of people with every single initiative. Let us see how Corporate Social Responsibility at Aachi Group is different. The agrarian economy in India is dependent on unpredictable monsoons against the backdrop dotted with low literacy levels and poor skill sets of people. This poses a huge problem of unemployment that needs to be answered by the helping hands of the corporate sec tor through their CSR activities. Mr. Isaac pitched in seizing this opportunity to uplift the livelihood and lifestyle of the rural poor by appointing agents in towns in his distribution network, which has grown with time to 4000 and hoping to increase in the days to come. These agents are exclusive dealers of Aachi products and this agency has proved to be a brow in disguise for them, in terms of educating their children on a professional note. In the Villages surrounding Chennai, Mr. Isaac noticed the suffering of many destitute women. With minimal education and skills, these women were struggling to find any employment to make their livelihood.With nature playing its own time through seasonal outbursts of rainfall and sometimes a havoc too floods or droughts, destitute rural women were left in lurch to fend for themselves to overcome the pressures to eek a living. Their support for livelihood came in the form of employment in different establishments of Aachi Group that did not call for specific job skills. In addition, a pick up and drop facility made by the organization from the homes of these women, added a lot of comfort to their jobs. These destitute women not only earned a decent pay at par with the best offered in the industry, but were able to educate their offspring’s, which was a far away dream will employment. This education for the next generation allowed them to get equipped with employable skills to bring about a sea change in their futuristic lifestyle. Mr. Isaac is a firm believer in the idea that education can bring about positive social change and empower even the economically weaker section of people with a power to get what they want and help them reach. In this era of high cost of education, many willing and interested students from economically weaker sections do not get access to quality education. To contribute his bit in the area of education for students who are deserving but cannot afford a decent education, Mr. Isaac took over and ailing school called ICI Higher Secondary School at Anna Nagar in Chennai. Children of house-maids, launderers, destitute women and other low income group people enjoy quality education at Aachi’s ICI School. In his official capacity as the correspondent of the school Mr. Isaac helps in imparting quality education to students from the economically weaker sections of the society. This is yet another example of Mr. Isaac’s intention and action to bridge the gap between the haves and the have-nots. A great enchanting event occurred on 6.1.2017. The founder of Aachi group, Mr. A. D. Padma Singh Isaac has made a green revolution by giving seeds to large number of farmers in Tiruvallur district without any advertisement and publicity. We salute Mr. A. D. Padmasingh Isaac for the selfless service in this difficult situation where in all channels we found the death of farmers every day. The founder of Aachi group Mr. A.D Padma Singh Isaac has made a green revolution by giving seeds to large no of farmers in Tiruvallur district with out any advertisement and publicity. We salute Mr. A. D. Padmasingh isaac for his selfless service to the livelihood of the farmers.In the current scenario, getting employed in a reputed organization is a challenge even to a physically and mentally fit person. Worse is the plight of the differently abled, who are dependent on their kith and kin to lead a near to normal life. In an effort render them self-sufficient and add meaning to their life, Mr.Issac provides employment opportunities to them, in keeping with their physical disabilities.Their placements are carefully chosen to ensure that it does not interfere with their disability but builds up their confidence levels to acquire a skill set matching their abilities. Over 25 visually impaired and differently abled people are on the roster of Aachi Group, and hopes to grow with business diversification. Aachi Group in keeping with the traditions of uplifting the needy and poor to a state of empowerment, has joined hands with Tennex Consultants in executing the Pradhan Mantri Kaushal Vikas Yojana (PMKVY), the flagship scheme of the Ministry of Skill Development & Entrepreneurship (MSDE) under the able leadership of our Prime Minister Shri. Narendra Modi in sector skill councils oriented to Retail and Food processing. Mr.Isaac always had a burning desire to pursue a social service activity dedicated in memory of his beloved mother Ms.Flora. To help the poor and needy to keep fit and make medical assistance affordable, flora clinic in Ayanambakkam was started. The beneficiaries included not only the blue collared employees of Aachi, but also the localities, for which the treatment and medicines are given on a free basis. Around 6,000 locals have been enjoying free check-up and medication from the Aachi Flora Clinic annually. Flora has employed Doctors and Nurses who share Mr. Isaac’s vision in medicating the poor and the needy. “Aachi, which has always been a socially responsible company has yet again showed its kindness in giving away an Ambulance to the ANDALAMMAL RURAL HEALTH CARE CLINIC, Thirukazhukunram.Andalammal clinic has been providing medical support to 200 villages in and around Thirukazhukunram, a place which does not have proper medical facilities. The clinic did not have proper commuting facility to bring people back and forth till today. In order to help and support their service to the poor and the underprivileged, Aachi has provided an AMBULANCE. 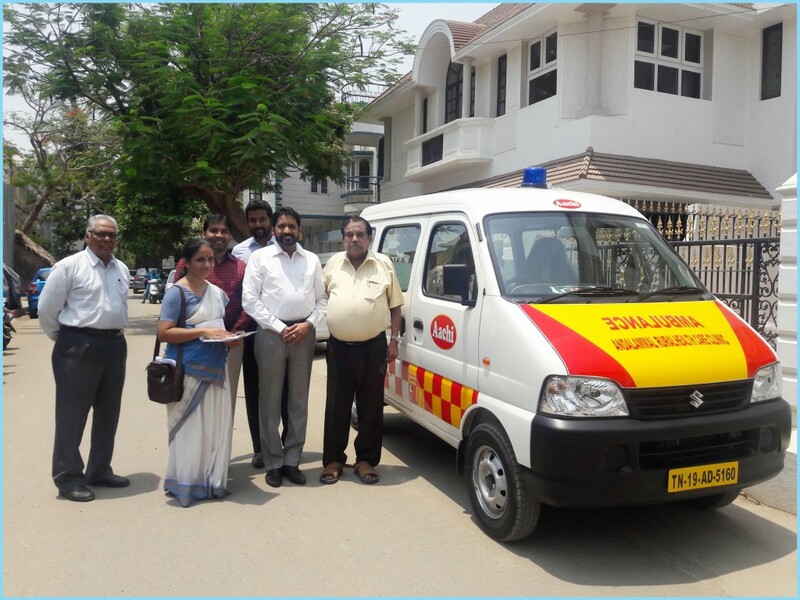 A word of gratitude from ANDALAMMAL RURAL HEALTH CARE CLINIC, Thirukazhukunram to Aachi Group.Our heartfelt gratitude to Shri Padmasingh Isaac and the Aachi Family for the kind act of donating an Ambulance to the trust, for providing Life Saving Service to the poor and the needy. The extra care and a kind heart is all that is required to make our world a better place. Being kind is something that the society lacks today. Aachi has generously contributed a VAN to the Guild of Service handicapped and homeless children. The trust faced lot of inconvenience to commute the children from one place to another. Even to take them to the hospital was a big battle. Today they have their own vehicle and they need not worry about the problems they faced earlier. “Aachi has set up the second Flora clinic at Gummidipoondi, SIPCOT to serve the poor and the underprivileged with medical diagnosis and advise by an experienced doctor Dr. Sathyanarayanan (M. B B.S)..
Aachi Flora Clinic offers free Medicines to the sick who visit our clinic ..
Our first clinic was setup at Ayanambakam, treating 1000+ patients a month. To insure the physical fitness of the employees, the company organized a free health camp spanning all the factory employees. It was a pleasure to see the total spontaneity with which the employees participated, and a panel of specialists from different walks of medicines helped to identify patients with malnutrition and vitamin deficiency. The management has given treatment and support to such ailing employees. Planting saplings is the need of the hour. The last half century has witnessed a steep and alarming rise in deforestation that has resulted in extreme and unprecedented climate change. A small effort in environment preservation by Aachi Group was a “plant a sapling drive” initiative by Mr.Isaac with the able assistance from his family and employees. This CSR practice has been decided to become a regular feature, on seeing the success of the maiden 500 saplings planted. The HR department of Aachi Group, under the leadership, direction and guidance of Mr.Isaac devised new methods to reach out to society at the hour of need. To mark the Founder’s Day, a blood donation camp was organized in all the business units of Aachi Group. It is impressive to note that the initial donor was Ms.Thelma Isaac, who acted as the potent source of inspiration to the workforce. Over 150 employees happily donated their blood and its success has marked the birth of a new CSR practice, which is bound to see newer horizons in the days to come too. In an effort to maintain the wellness among the employees, Aachi Group has been regularly following another CSR practice for several years – free eye check-up and eye care camp, covering all the employees. The year 2015 witnessed a ceremonious eye camp which was conducted for 3,000 Aachi employees and spectacles worth Rs. 750 was distributed for 600 employees who were diagnosed with vision problems. Scores of employees were the beneficiaries, and this was an occasion to be celebrated, as the poor sighted employees were given free spectacles by Mr.Isaac on the Founder’s Day.. The lashing of the relentless rains in Tamil Nadu proved Mr. Isaac’s social responsibility and purpose as an Entrepreneur. He generously supported the victims with 10,000 packs of relief material with basic provisions 10kgs rice and 2 kg provision. As an understanding employer he big-heartedly distributed provision and food for 2500 Aachi employees who suffered in the flood, most of them from Gummidipoondi, Redhills and Ambathur area. 1,00,000 Aachi Bottled Water was liberally distributed for all the stranded flood victims in MIOT hospital.